Ty was adopted by Karen in 2015 after waiting a while on our site. 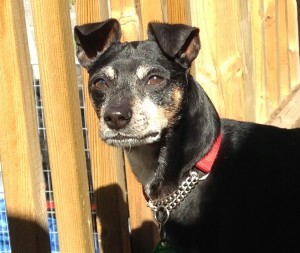 Ty is an older dear dog who has found a great home!! Karen says “He has settled in nicely. He is ‘practically perfect in every way’ just like Mary Poppins. He has never had an accident in the house, he doesn’t bark when I am away, walks well on leash, and ignored the cats (that’s a picture of the two cats below). He curls up beside me as soon as I sit down on the sofa and curls up on the bed as well. Lately he has been trying to usurp my Siamese cat’s place in bed but that’s not going to happen….it was hilarious watching [one of our cats] yowl, growl, and hiss at the dog while Ty didn’t even acknowledge his existence. The cat was very confused and a little bit ticked off, so eventually he gave up on the hissing and stuff since it had no effect. Last week I was able to give all three of them treats in the kitchen at the same time. With my Labrador retriever, it took the cat 18 months to tolerate the dog. He does bark a bit at some people, but corrects easily. He does get grumpy with some dogs, but I think I need to introduce him to other dogs in a different way. He is a lovely confident little guy who immediately took to my house as if he had always lived there. It was only a few days until he knew the routine and now anticipates what I’m going to do before I do it. When we go for walks, he doesn’t ‘walk’ so much as prance along. I don’t think I could have a better companion. He’s Ty-rrific!” He sure is!